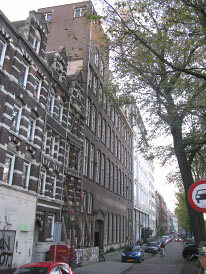 Hartcamp 'domestically-styled' his 1921 building's Dacostakade facade. Each of its 6 bays includes twinned windows. 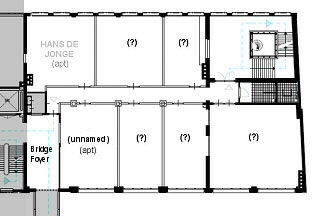 At its far end are two entries: 158 into the private mb/dc central foyer and 160 into the public Dijk Theatre (former Co Library) whose big rectangular volume fills the centre 3 bays to level-2 height and half the building's depth. At the near end are two more entries: big vehicle doors at 162 lead under the building into the central Courtyard; 164 is the residential south-stair. 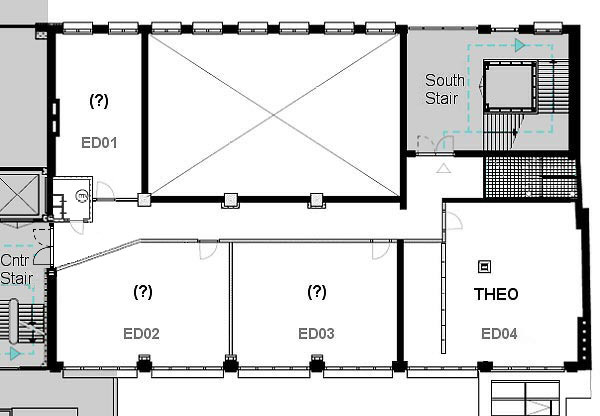 The entry at the extreme left (south) end is 164 the south-stair onto which all Hartcamp's residential enclaves - level-1 to level-5 - open at their south ends. 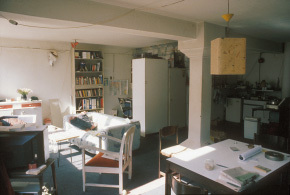 L5's pitched roof restricts the L5 enclave which uniquely consists of just two huge apts. 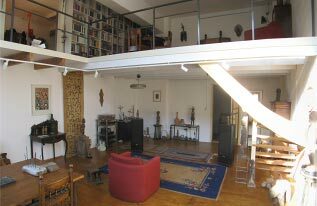 From L5 it continues to L6 as a square tower where it serves the west-side roof terrace and its associated 1963 penthouse. 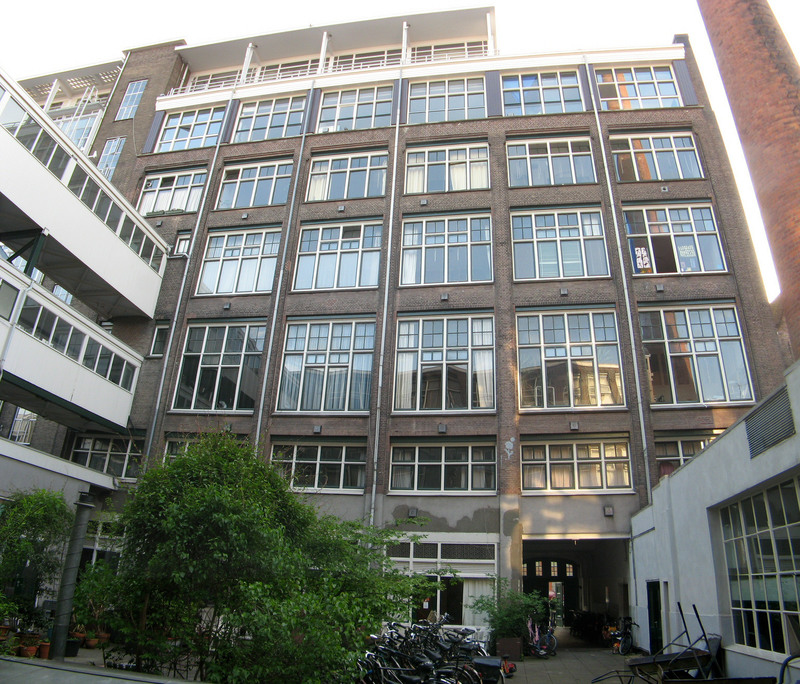 The Hartcamp building's 6-bay facade and 'penthouse' are visible from the Courtyard. 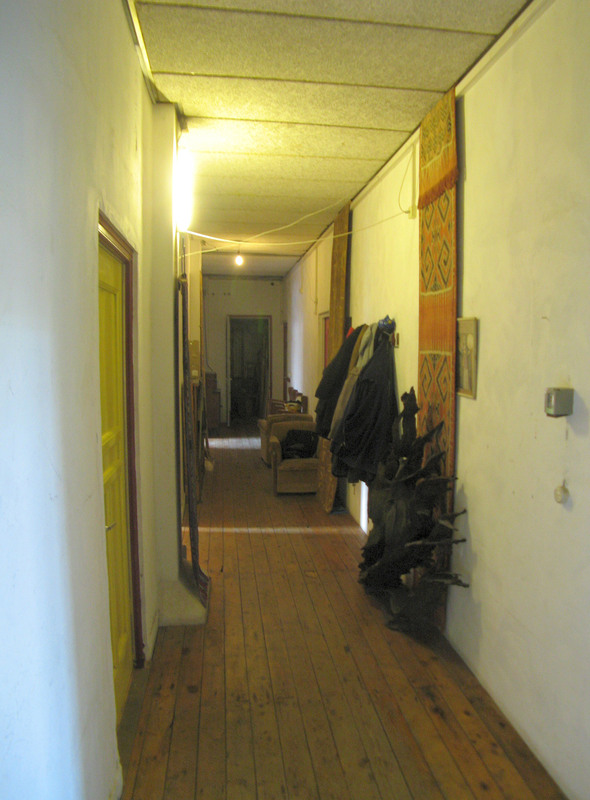 The courtyard level L0, through L1 (the "Entresol"), L2, L3, L4, L5, and finally L6 the Merkelbach penthouse. 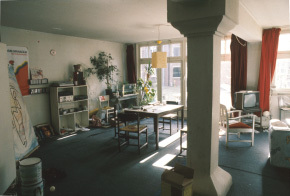 Hartcamp's south bay overlaps the S-side workshops. 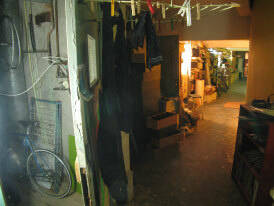 Tetterode's vehicle-entry tunnel runs under one of the L1 'entresol' bays. Hartcamp's north bay serves Tetterode's circulation at L2 and L3, where central stair landings extend into it as bridge foyers. 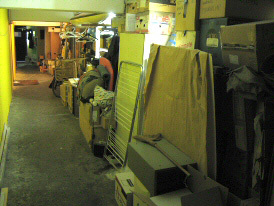 A section through the centre bays (and central support pillars). Through the big Theatre volume that rises past the L1-entresol floor, reducing it to half the building's depth. 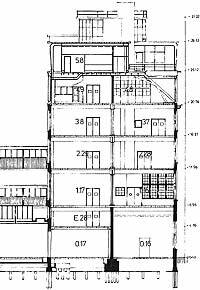 At level-5 the sloping roof's rafters cut diagonally into the east side. At level-6 Merkelbach's 1963 'penthouse' tops the west flattened portion of the Hartcamp roof. 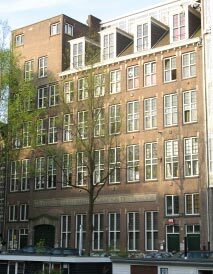 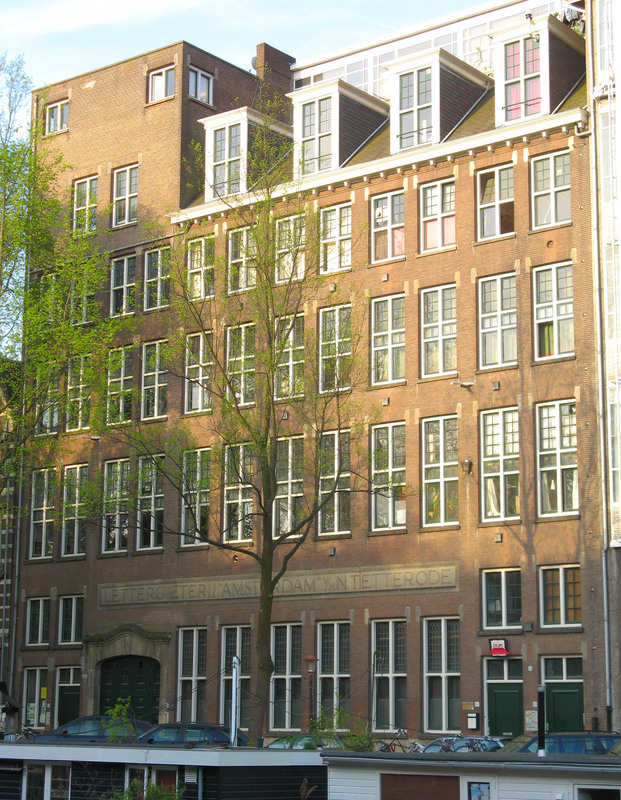 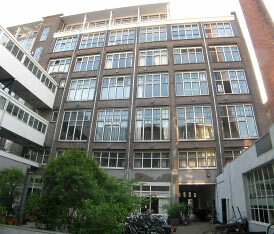 The 1921 Hartcamp building has little of Merkelbach's sophistication and scale - its constructional technology and its architect's espousal of a 'domestic' style on its Dacostakade front possibly influenced apt development; it certainly reduces ones fantasy expectations of domestically invading a factory, from 'pioneering grandeur' (re: the best Merkelbach apts) to a rather 'familiar appropriateness'. Hartcamp floors L 1 / L 5 / L 6 are reduced in width which has led to a simpler division of the narrower floors into a few exceptionally large spaces. 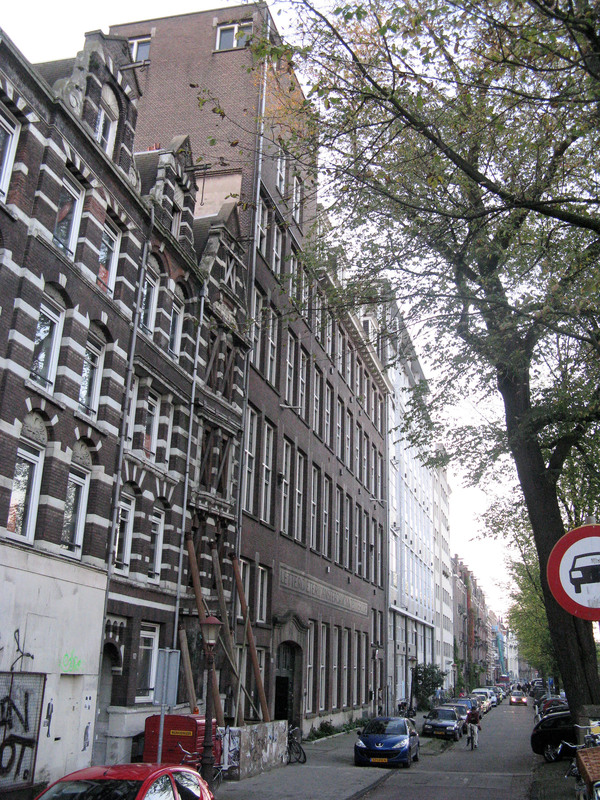 Level 1 loses almost all its E side to the double height Dijk Theatre and levels 5 and 6 are narrowed by the east-facade's dormered half-roof. 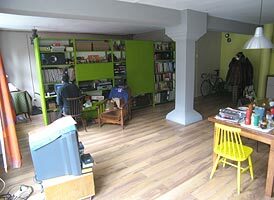 Merkelbach's low-ceilinged 'entresol' floor [mb-L1] is used for work-spaces - this Hartcamp version is domestic. 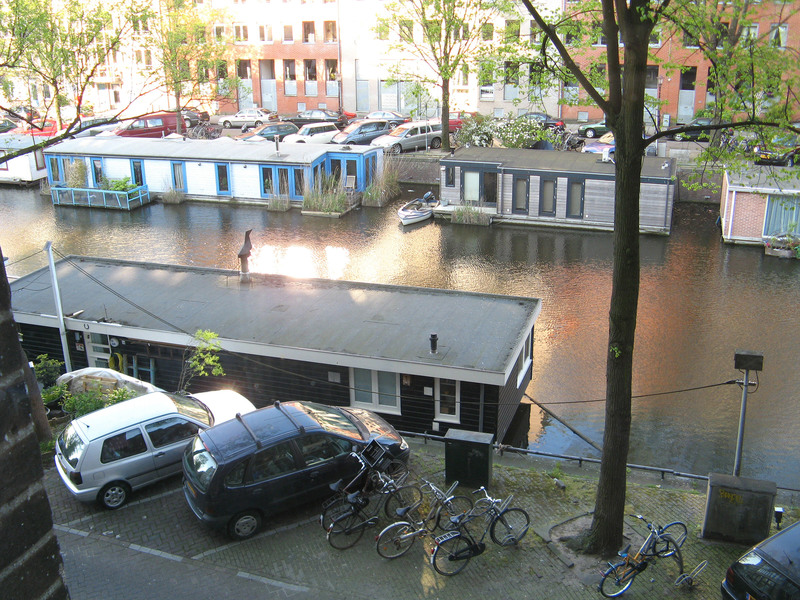 The 2.6m height floor seems oppressively squeezed by the huge ½m beams, and laterally by the vertical intrusion of the Dijk Theatre (the old Co. Library), which claims three of the four east bays behind its buttressed wall. 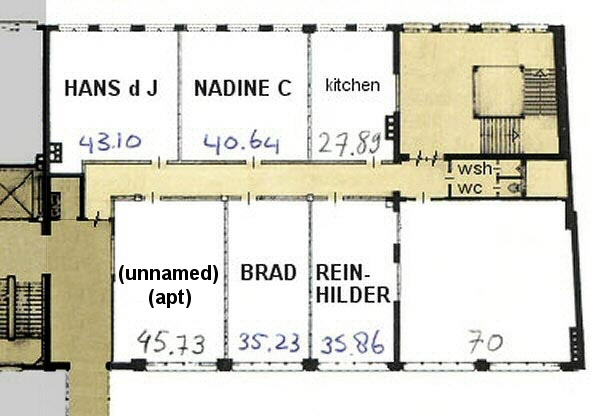 The remaining space accommodates four apts - a small (unvisited) space north of the theatre (over the Dacostakade street-entries) and three big west-side spaces. 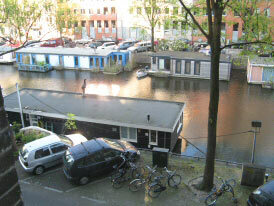 The two 'one-sided' Hartcamp enclaves (L1 and L5) both use their access passage intensively as store-space. 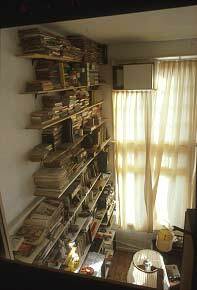 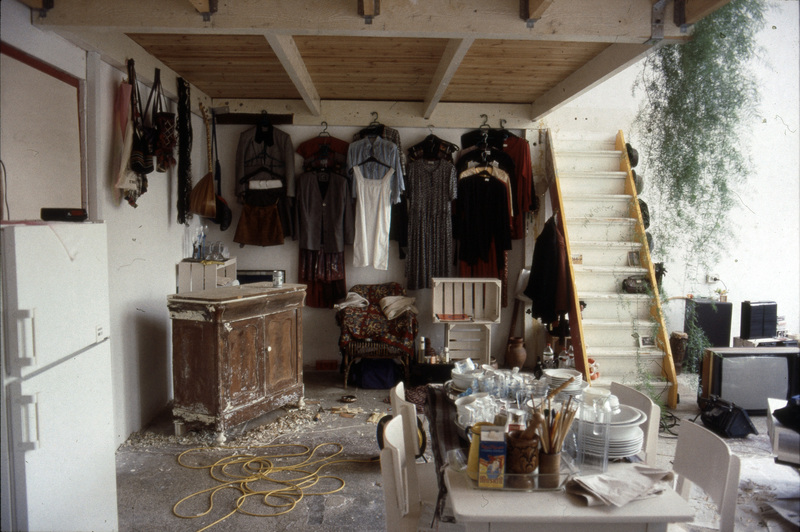 In L1 almost the whole east side of the enclave passage is a blank wall (abutting the Dijk Theatre) which is faced along its whole length with stored items and storage-units. 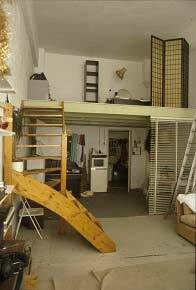 This may be simply a 'lazy' response to opportunity and/or (at least in L1) a necessity for apts whose height precludes mezzanine storage spaces. Just inside the enclave's north entry a single-bay apt opens to the east; for the rest of its length - unlike the three enclaves above - its east side is a buttressed blank wall encumbered with storage, telephone table, etc [pic: left] - behind this is the upper portion of the Dijk Theatre's double-height space. 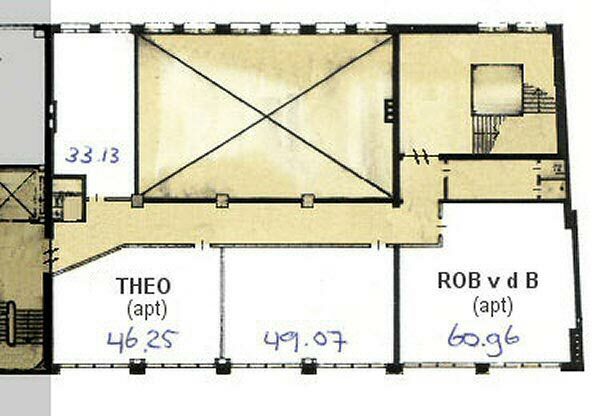 On its west side the passage serves three large 2-bay apts - at the date of this photo the nearest open door is Theo's [see below], beyond the big beam is the centre apt, and the door of what was then Rob's apt faces us at the far (south) end. 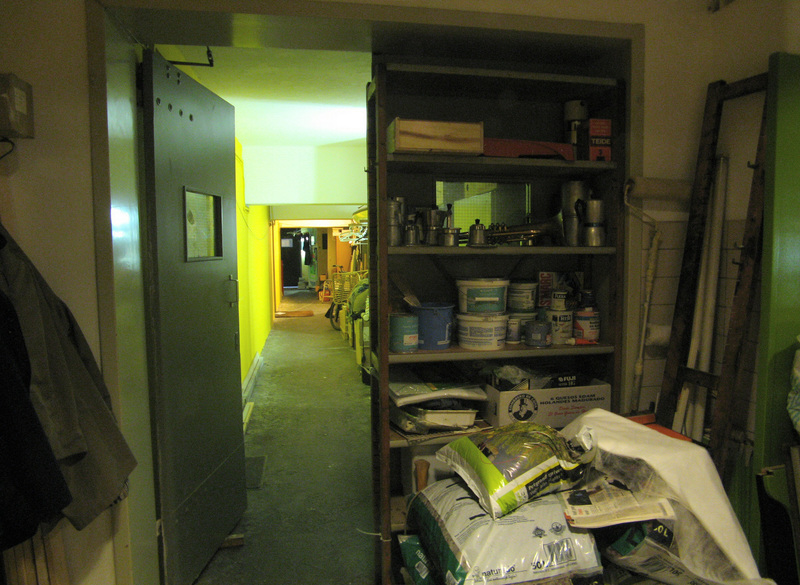 Because the central passage is pushed by the Dijk Theatre to the west the door to the south stair is set in a deep lobby into which the corridor storage continues. 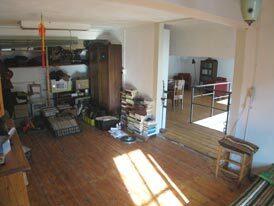 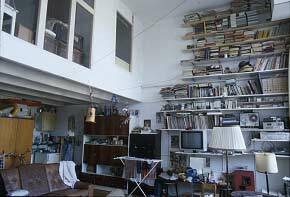 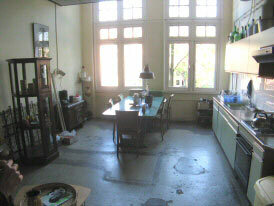 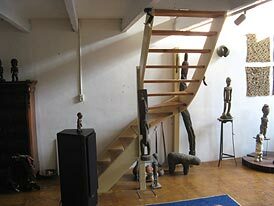 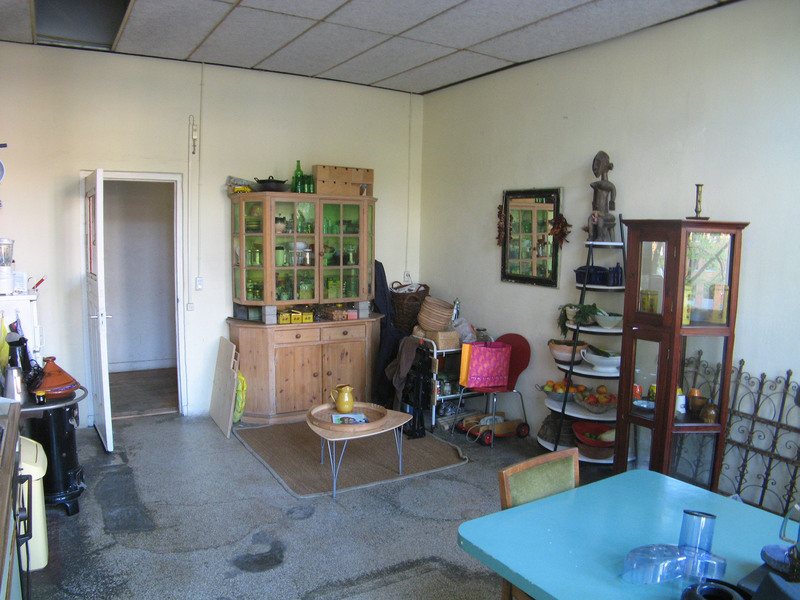 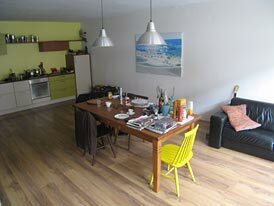 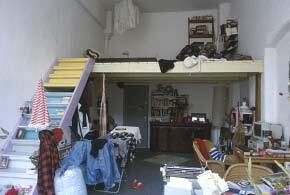 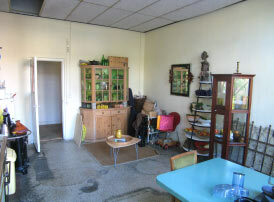 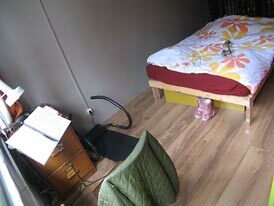 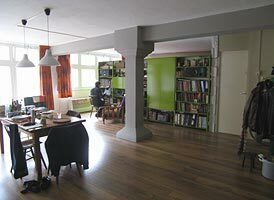 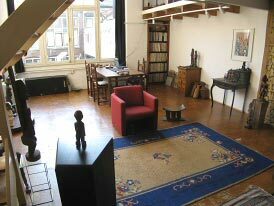 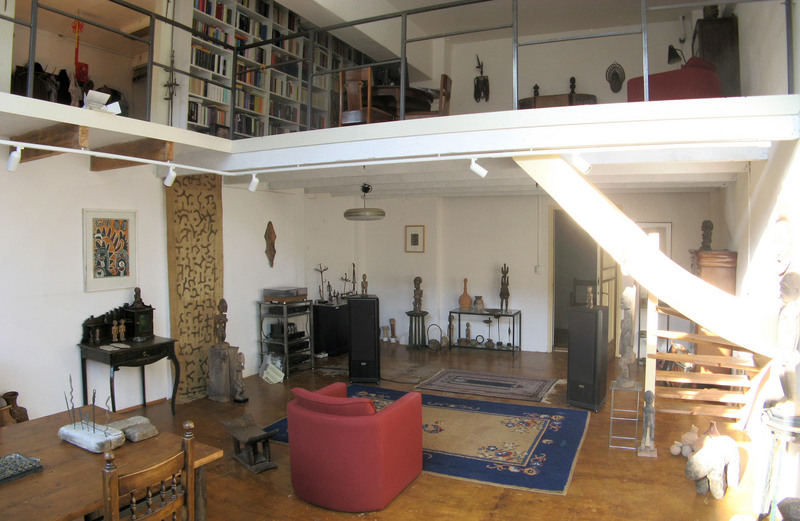 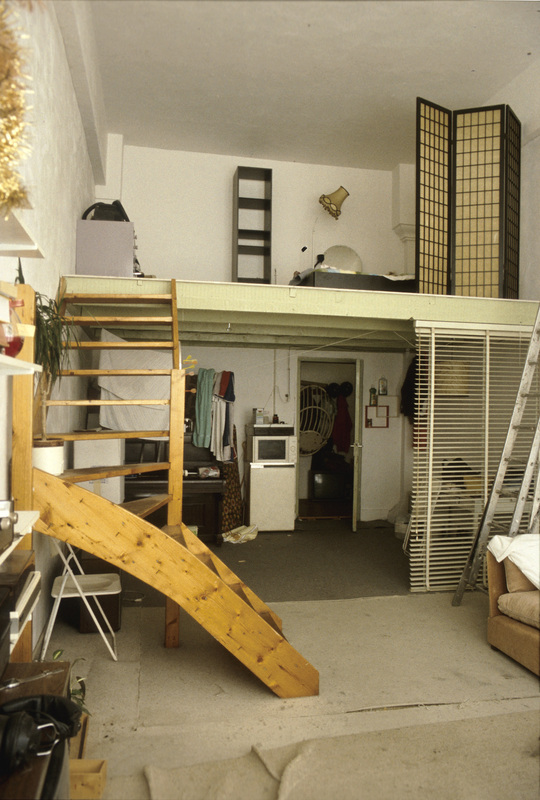 A single-level apt space - this low floor (approx 2.6m) allows no mezzanines. The beauty of 'direct-statement' - design without style: the order of convenient use. 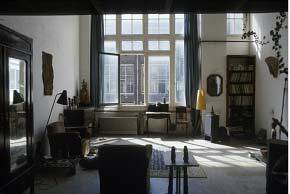 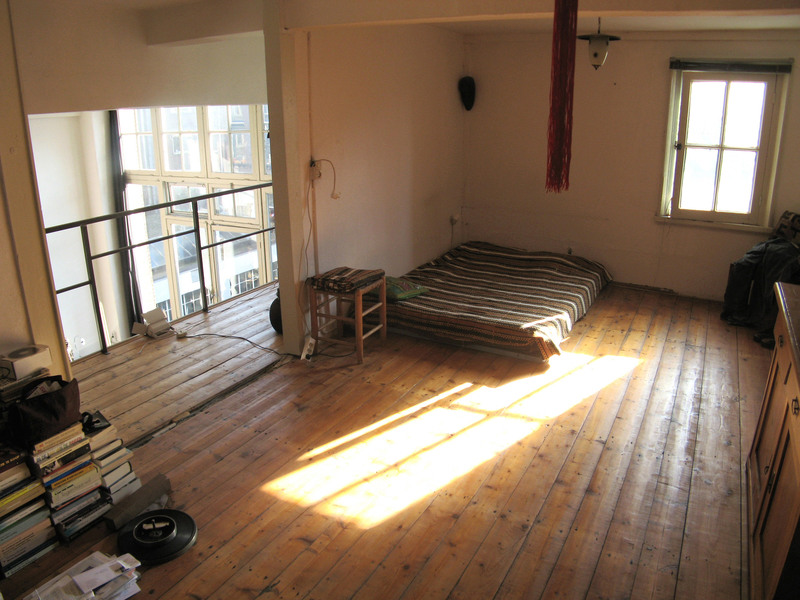 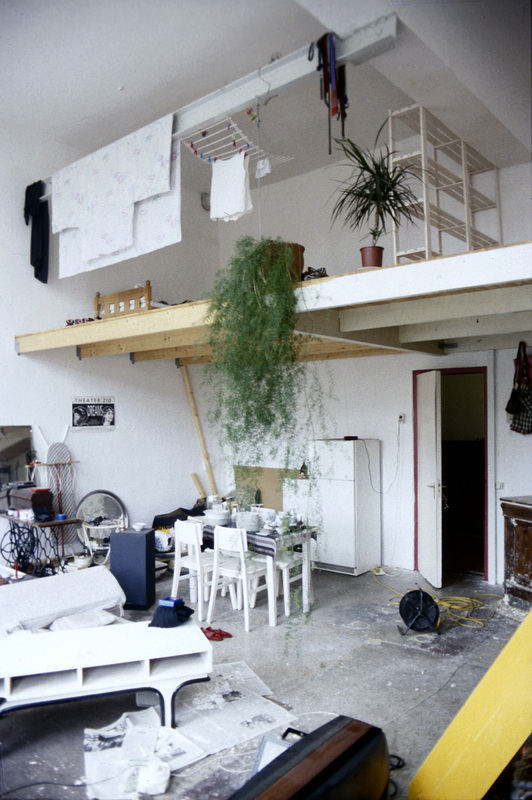 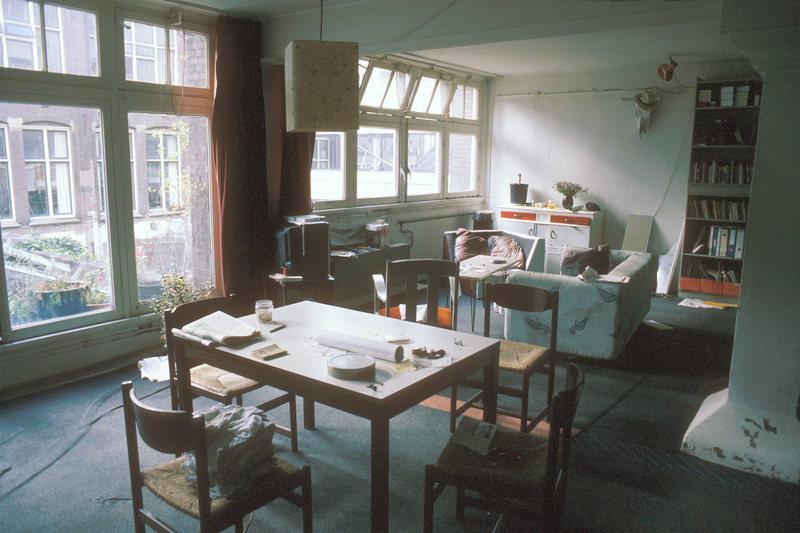 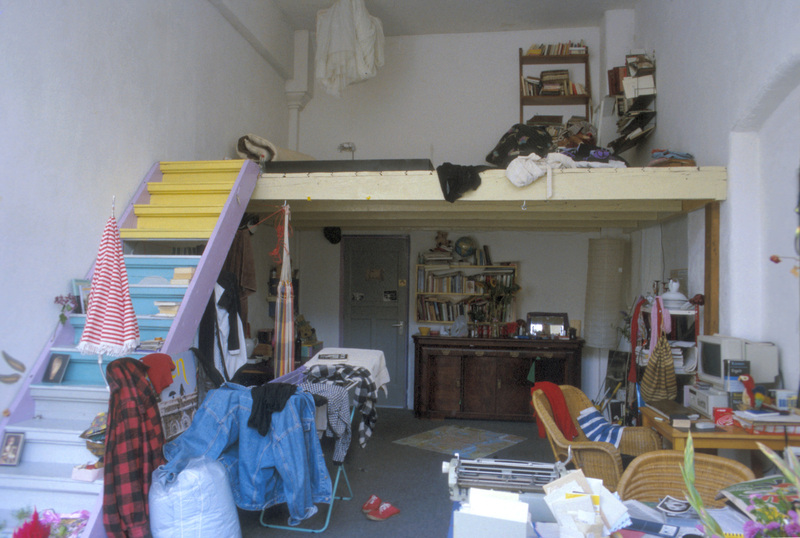 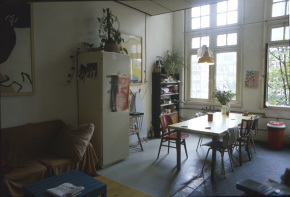 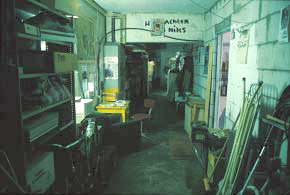 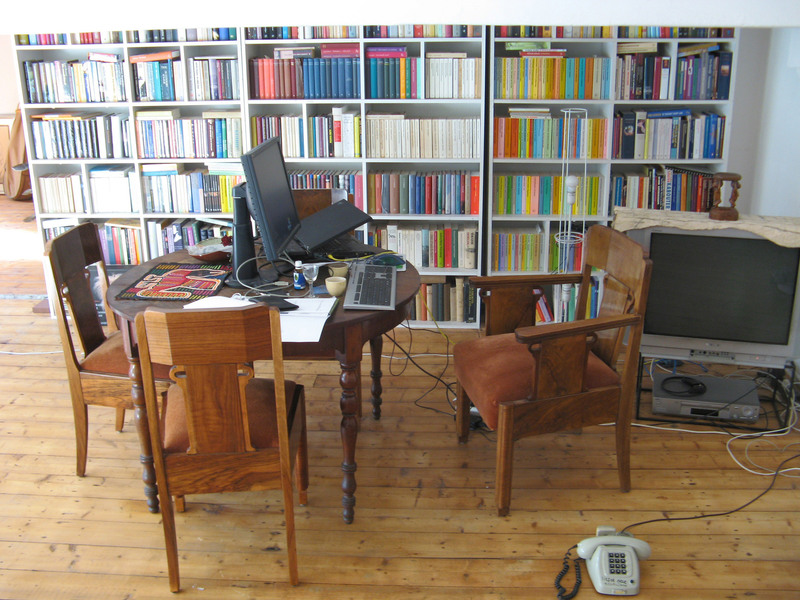 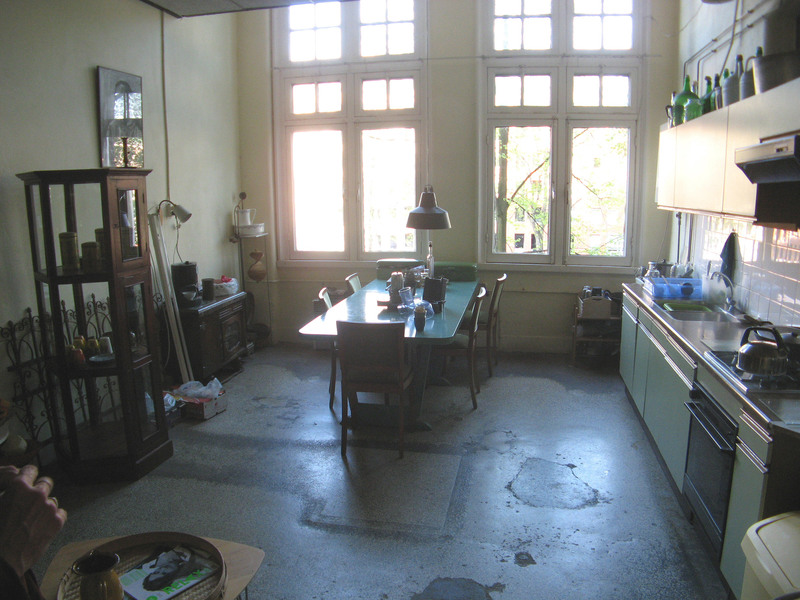 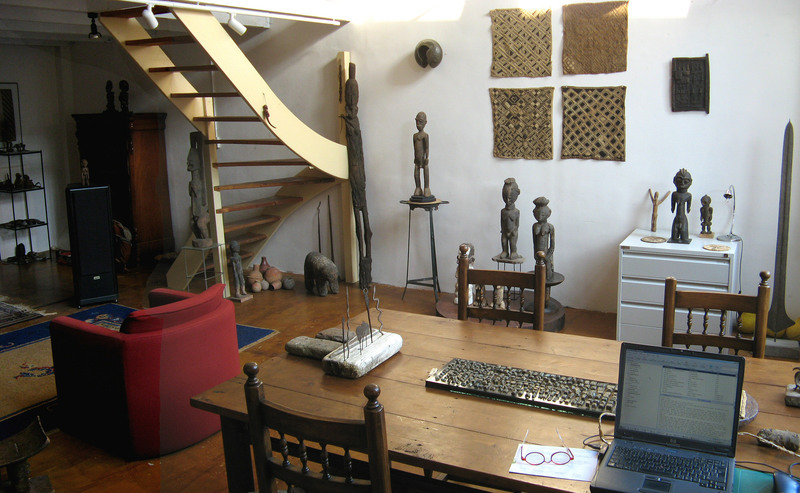 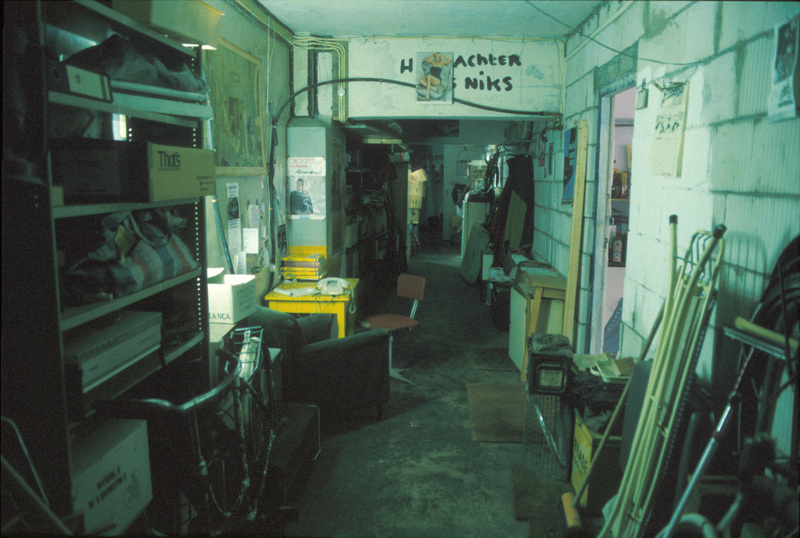 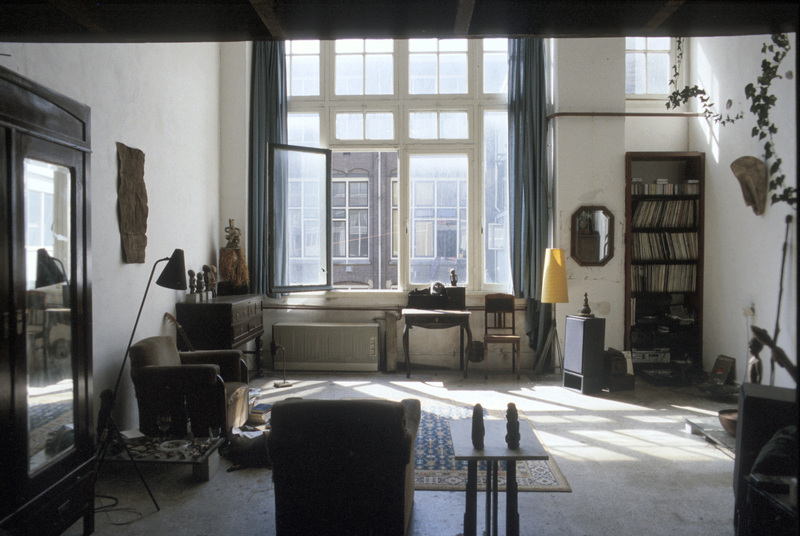 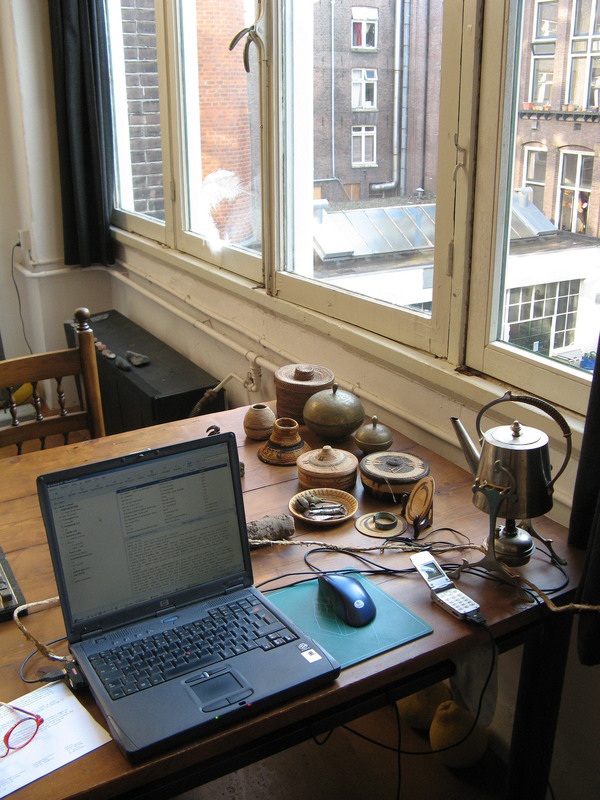 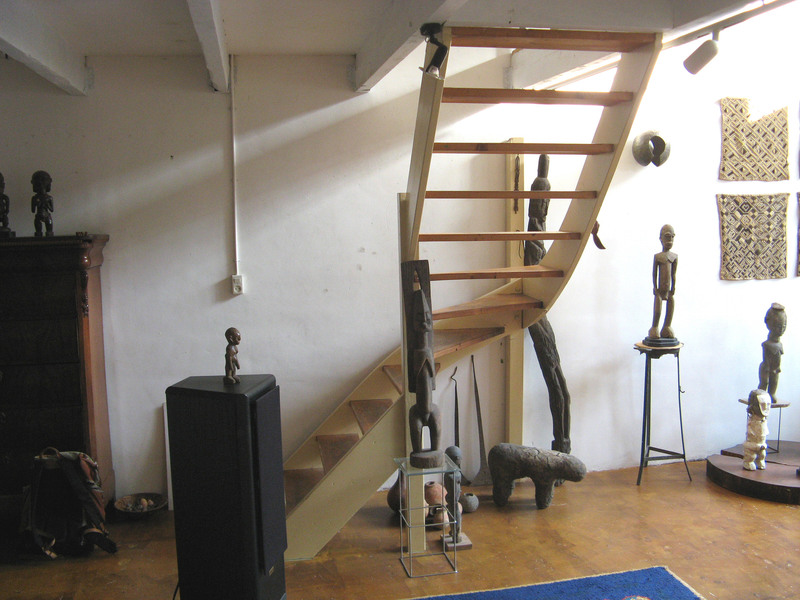 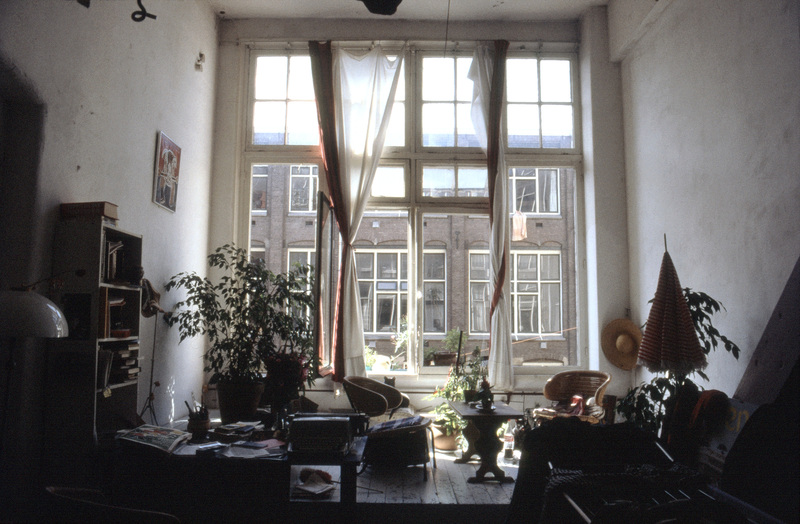 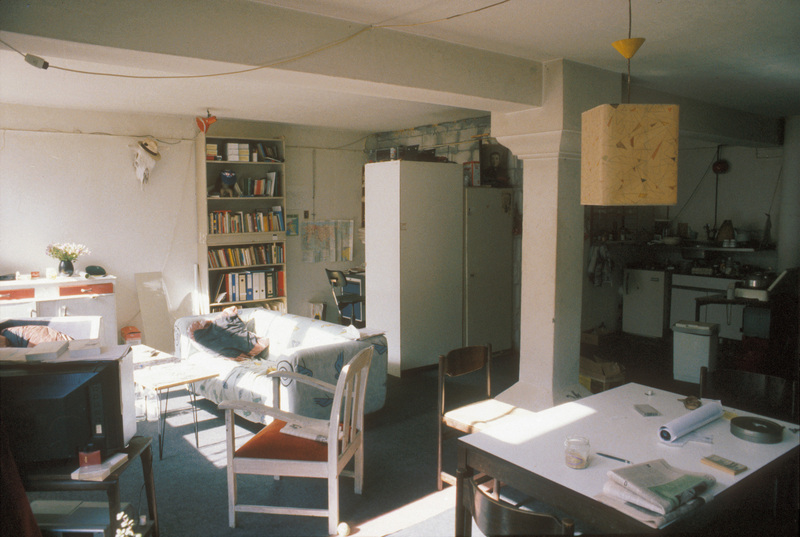 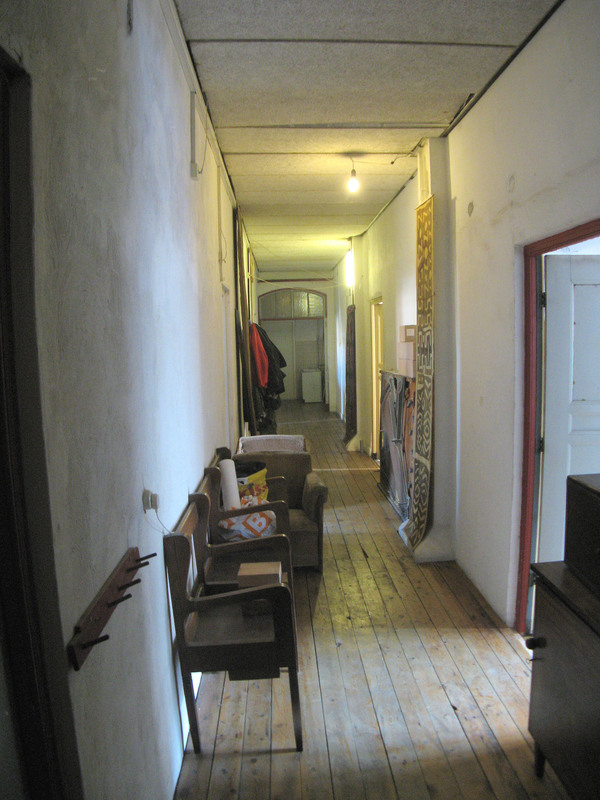 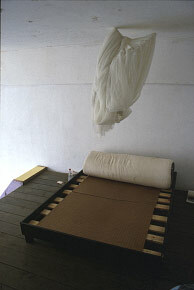 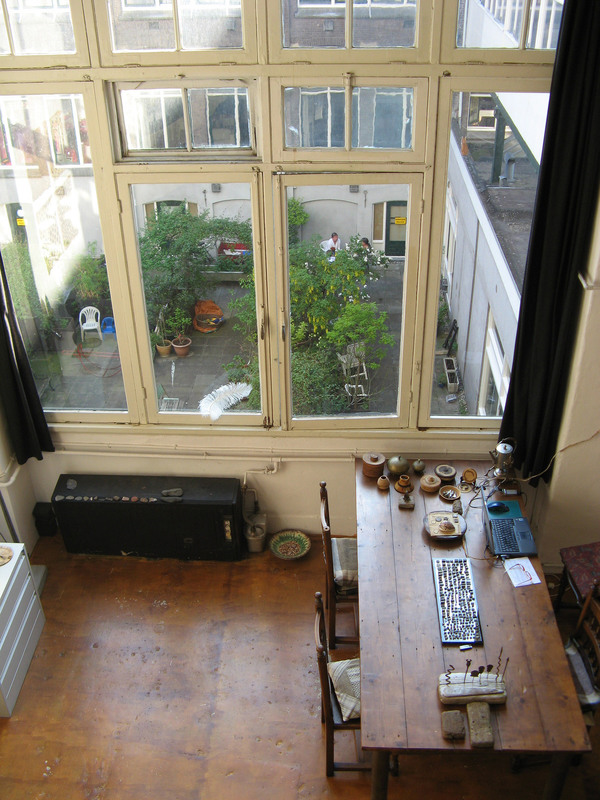 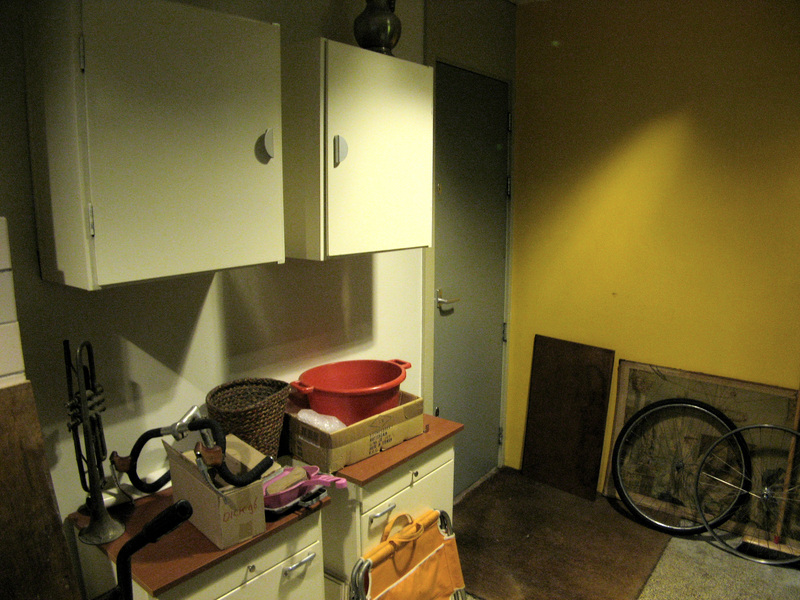 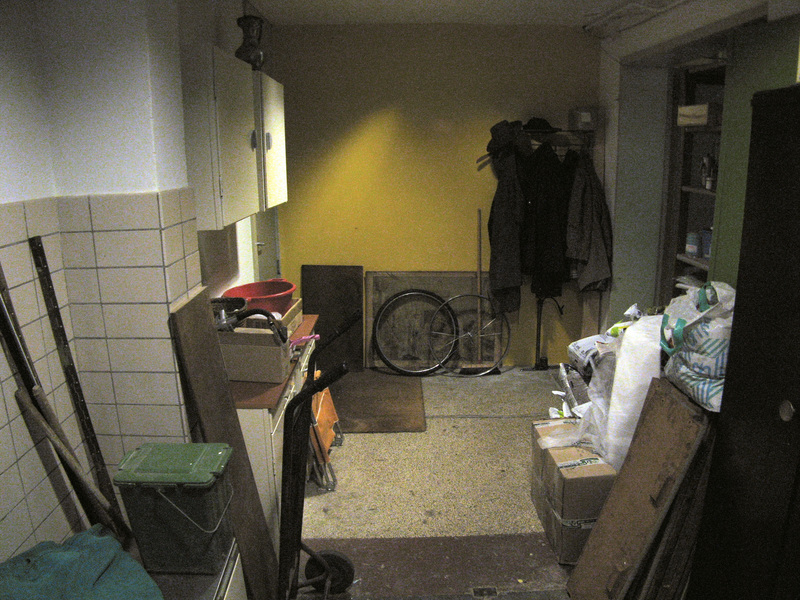 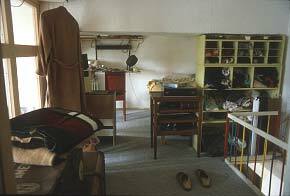 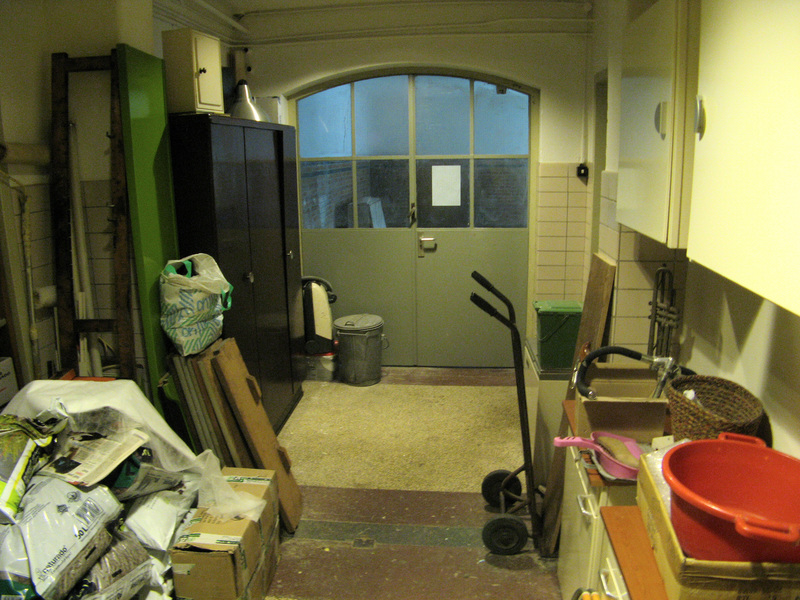 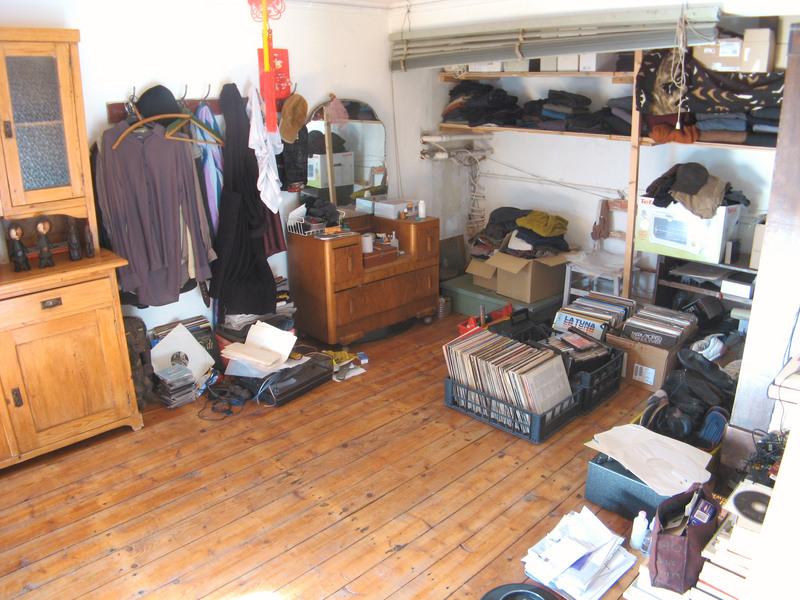 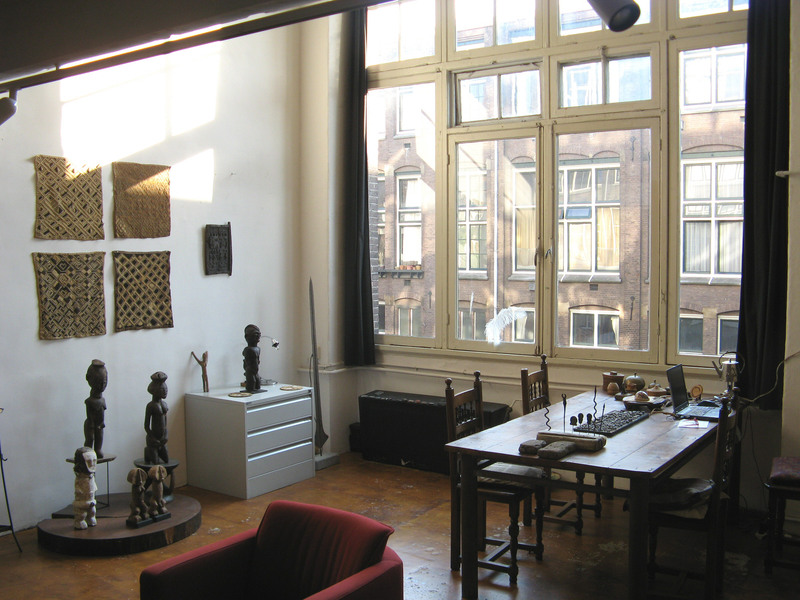 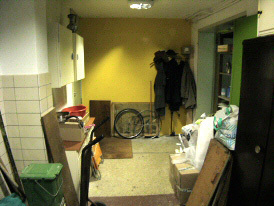 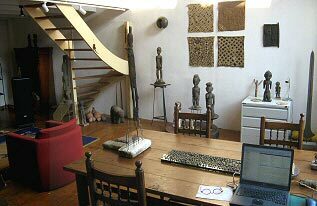 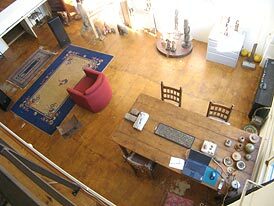 Rob van der Bosch left this space in c2007; it was then taken by Theo who moved from his smaller north-end space [shown above] in August 2007. This is the largest of the enclave's living-spaces, situated at its south end where the access passage bends around the intrusive volume of the Dijk Theatre to reach the SE-Stair, releasing extra space for this final apt. 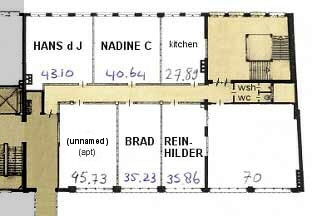 The floor's most spacious apt - wrapping the south end of the enclave passage and possessing L1's only full-height window. View towards the kitchen area. 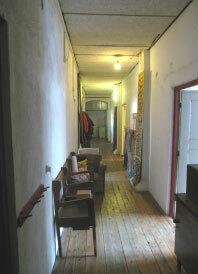 The corridor's S-end narrows the apt beside the kitchen; the pillar blocks our view of the apt's entry. 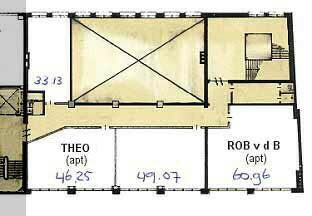 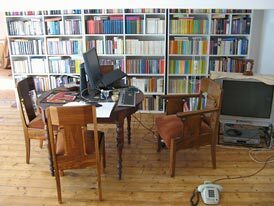 Theo moved into Rob's larger southern space in August 2007and made considerable 'finalising' changes that clearly demarcated areas of use. 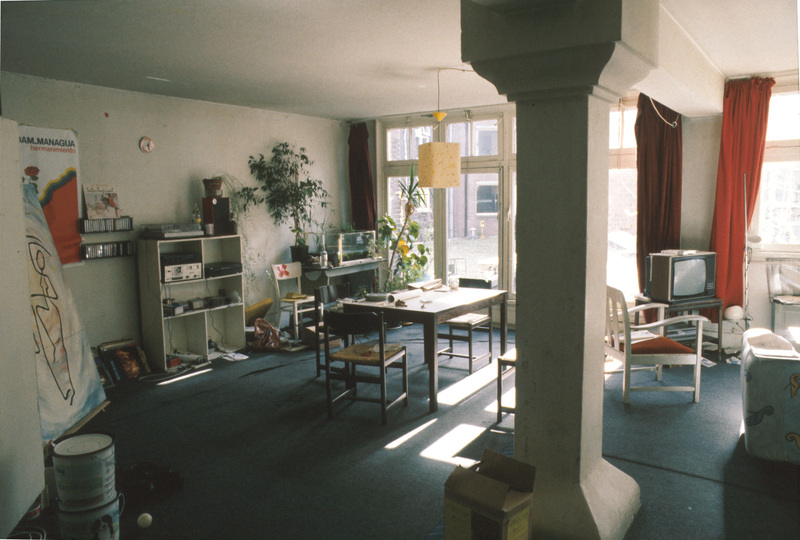 Rob's layout was a pragmatic accretion of functions - Theo has cleared the space and with a minimum of useful furniture and fittings made clear functional zones. 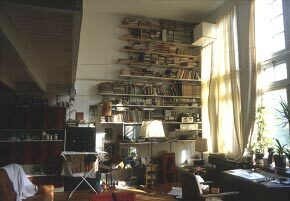 He has screened, with a long free-standing 'storage-wall', a narrow portion across the north end for music and sleeping. He has made a new floor which is insulated against the cold seeping up from the vehicle-entry tunnel [Dacostakade 156] that passes beneath this apt. 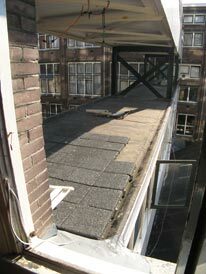 He has also begun to make a garden terrace on the roof of the courtyard's south-end workshops, accessed via the entresol's uniquely large south-end window. 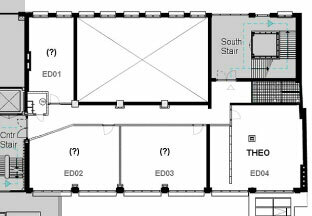 Theo's apt is at the south end of the enclave's passage, where it makes a turn to the east and effectively becomes the lobby of the enclave's south door that exits onto the L1 landing of Hartcamp's south stair. 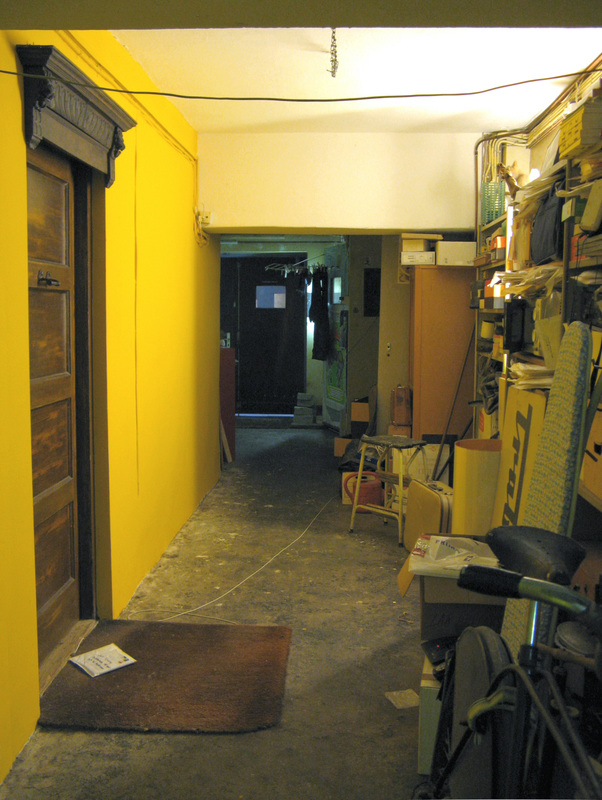 Theo's door faces down the whole length of the enclave's passage - [ref above section: 'ENCLAVE (in 2008)']. The apt entry door [pic rt] - set in the north wall of the eastern extension of this large space - faces down the enclave passage. The large free-standing book shelving unit screens the bed space. Between the L1 'entresol' and L6 'penthouse', the height of floors is between 5m (L2) and around 4.5m (L3 to 5) - enabling full-height mezzanines. 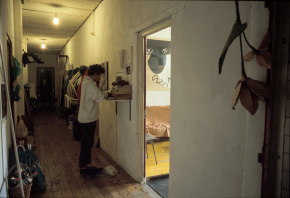 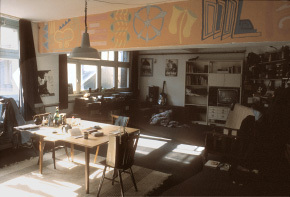 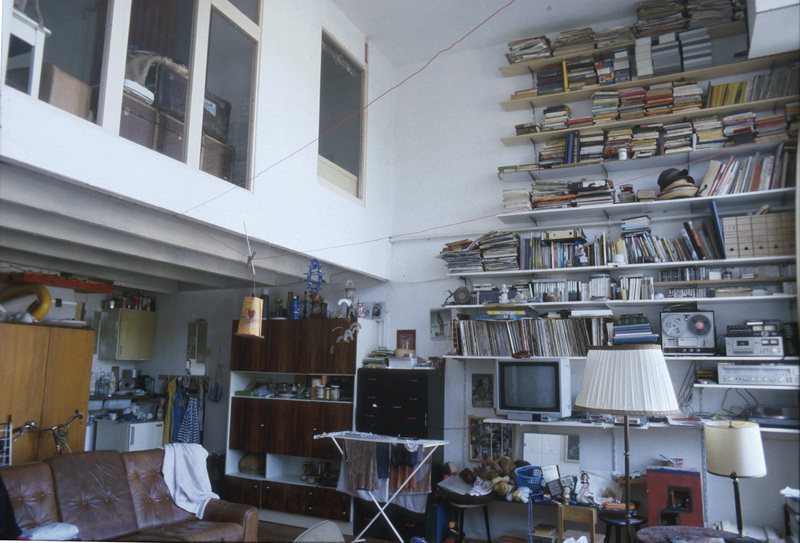 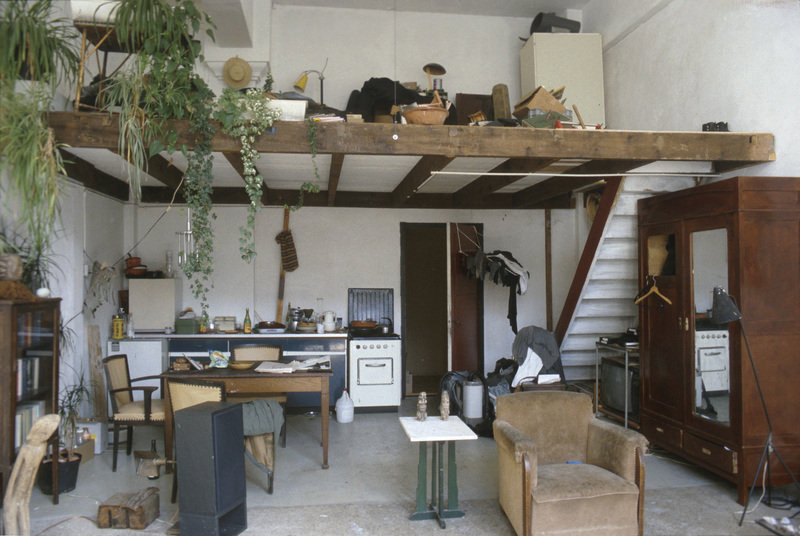 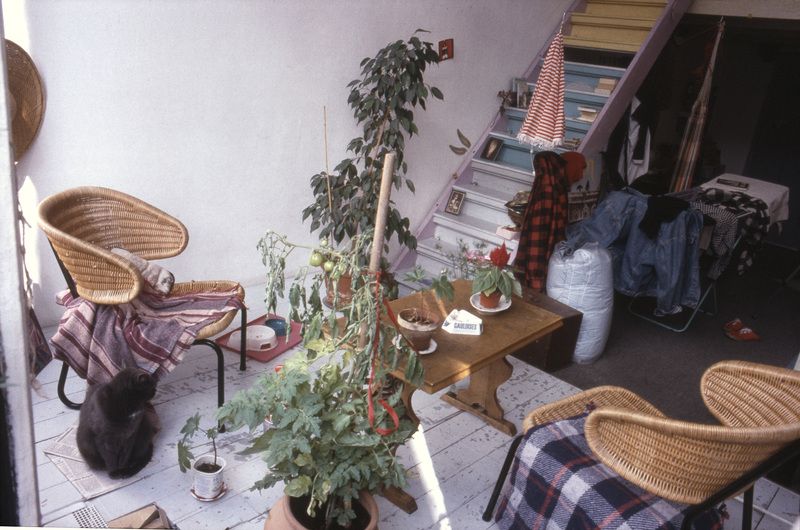 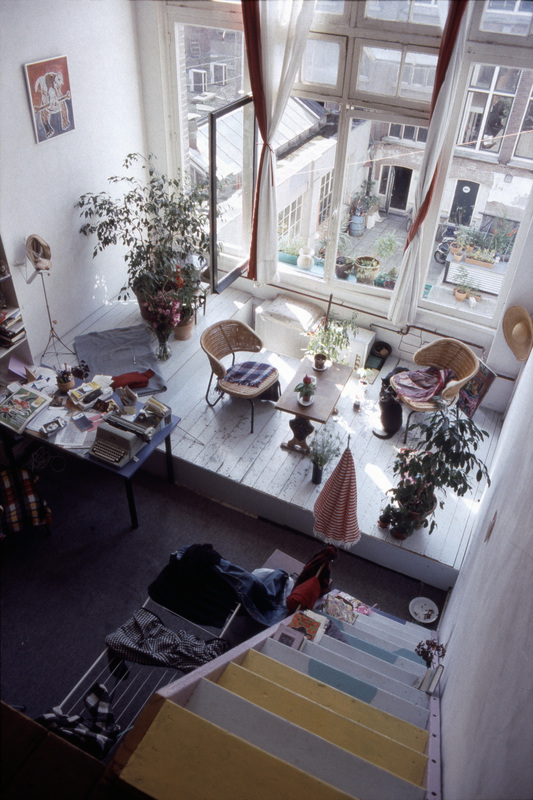 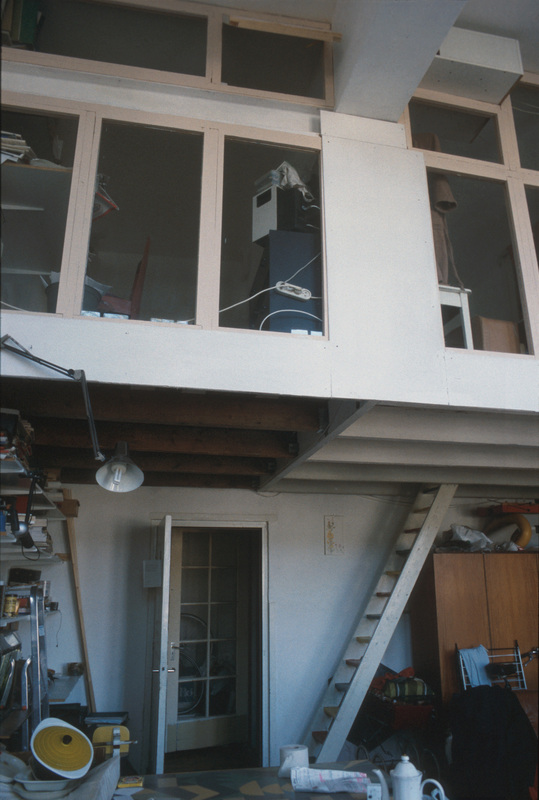 Many of the apts in Hartcamp L2 and L3 exemplify a very basic stage of the typical means of spacial and functional differentiation: a mezzanine platform at the inner windowless end - employed in almost all Tetterode's high (4m+) yet small-area spaces (typically ½-floor depth and 1 or 1½ window-bay width). 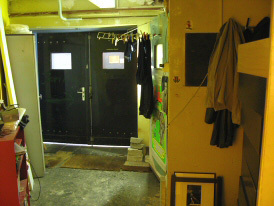 The enclave's centre access passage has apt doors each side - the open door is the communal kitchen [re: next pic]; just outside it is a shared telephone. 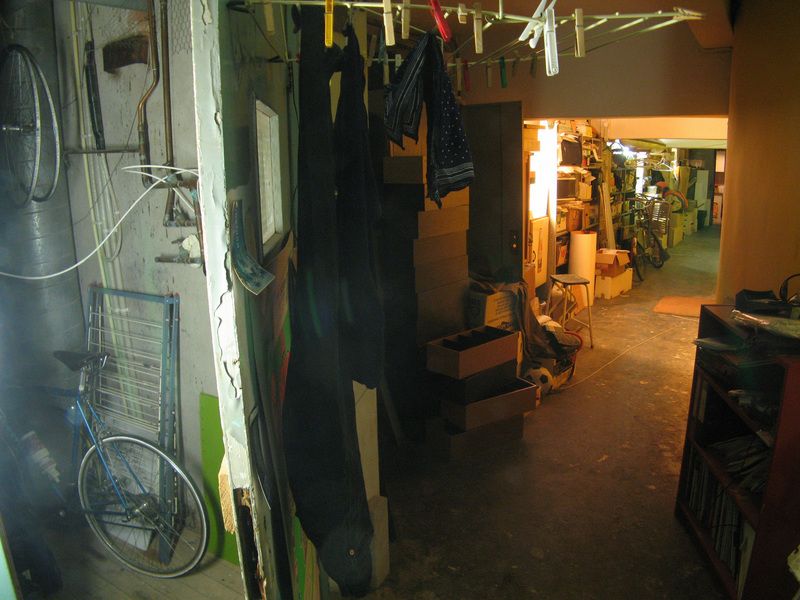 At the far end is the enclave's entry door from the central stair/lift. 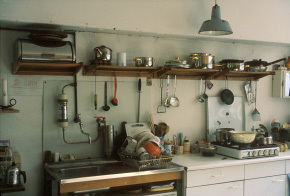 Apart from the expression of a need for 'aesthetic comfort' which affords it a 'domestic-personalness', this communal kitchen is very similar to L3-enclave's communal kitchen. 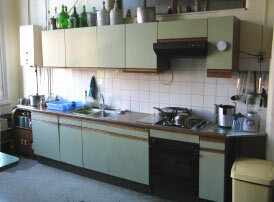 The kitchen is in the same 1-bay floor-location and is almost unchanged in its general arrangement - however it lacks its coherence ##. 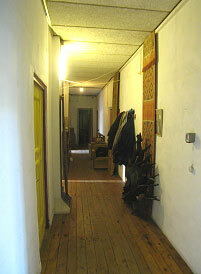 View towards the passage entry door. 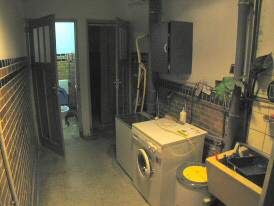 [NB: These photos were taken during my 3 day residence. Unfortunately the whole pattern of Hans' order is compromised by my couch towel]. 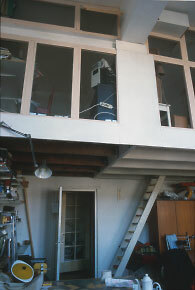 A space 1½ window-bays wide (a structural anomaly), with a walled-in mezzanine. 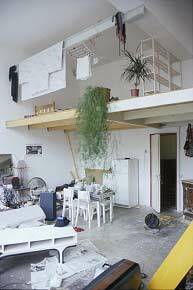 This apt is more differentiated spatially and more 'home-like' in its degree of investment in fittings, than the 'bed-sit' simplicity of many of the L2/L3 apts. 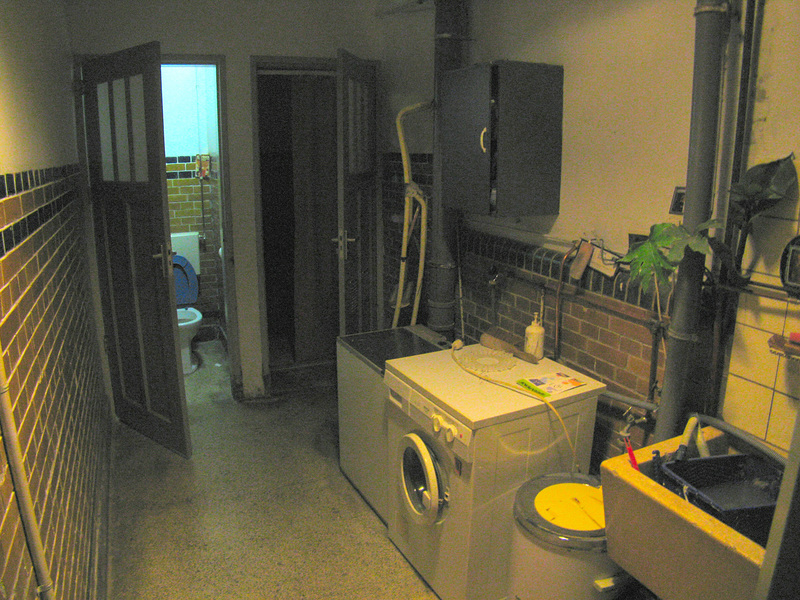 The apt is being reconditioned. 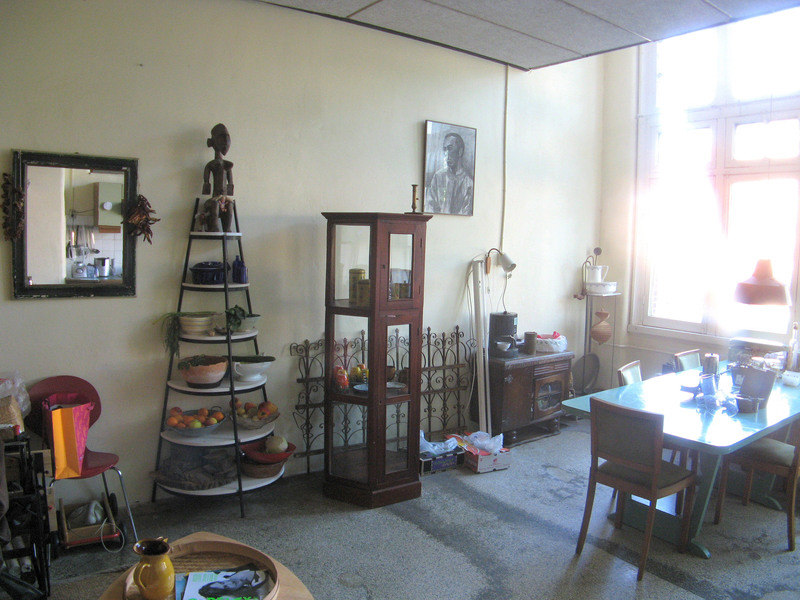 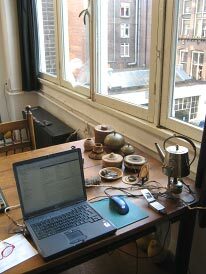 A small work-space on the north side of the apt-spanning portion of the mezzanine. 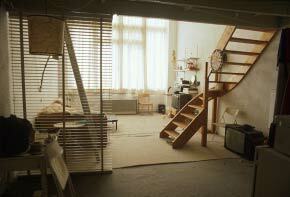 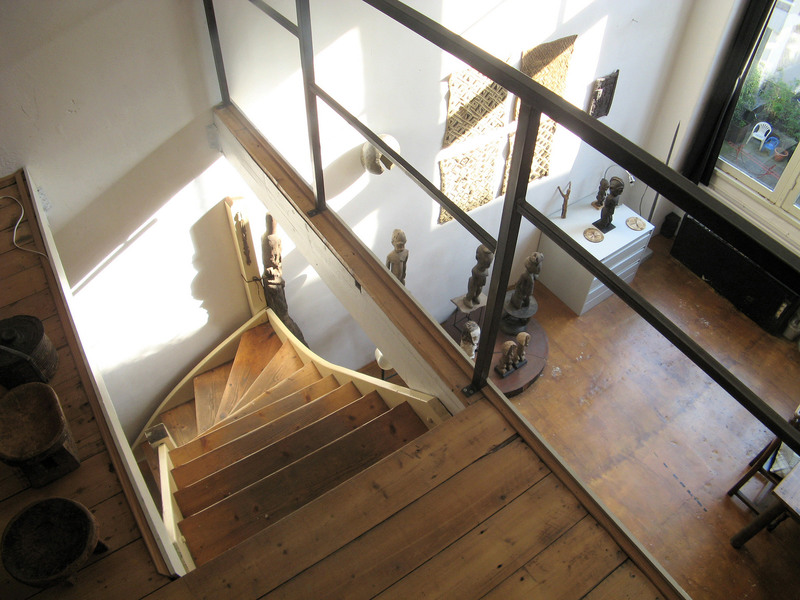 We are looking back into the original living-space from the mezzanine extension over the bridge-foyer. It took about 3 days to cut the opening through the L2-Bridge foyer wall and three weeks to make the new mezzanine floor. 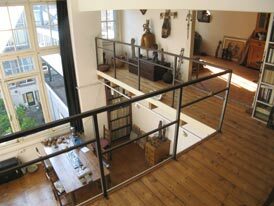 On the mezzanine extension over the L2-Bridge foyer. 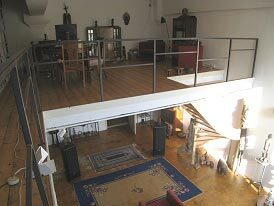 On the mezzanine extension over the L2-Bridge foyer. 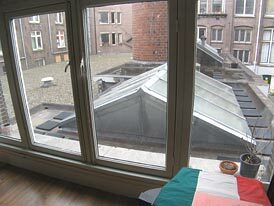 The small window abuts the north side of the Courtyard bridges. Brad made this apt in c1988 and left in 1992, it is now temporarily occupied by Alfonso, a visitor.